Want to participate in the ministry of Flourish San Diego? Whether you consider your contribution a tithe, a charitable gift, or missionary support, we want you to know that we are humbled that you would consider joining the work of our disciple-making movement. In the following instructions, you will find the varied ways you can contribute financially to the work of Flourish San Diego. Thank you. Please click below to go directly to our secure online giving page. You can support the work of Flourish San Diego by writing a check and then sending it to us in the mail. This will cost you a stamp, and keeps our processing costs low. Download, print, and fill out a pledge card with all relevant information. Mail the check & pledge card to us at the address on the right-hand side of this page and we’ll take care of the rest. If you wanted to set up automated bill pay from your bank, that would work as well. Like receiving a paper check above, we have no processing costs. You will need to set this up through your bank. If you would send us a pledge card with all relevant information as well, then we can keep the correct records on file as your gifts come in. For stock and mutual fund gifts, shares are transferred into an account owned by Flourish San Diego. We then sell the shares. A check is issued for the value of the stock or mutual fund. Once the check is received, it is deposited and credited according to your intentions. To initiate this process, you can use the Stock Transfer Form (download the PDF here) to instruct your broker to transfer your shares from your account to Flourish San Diego. In most cases, we are not notified of the transfer by your broker. Therefore, this information is required so that we can properly acknowledge your gift and designate the funds to the staff or ministry of your preference. It can be sent by mailing a completed copy of the Stock Transfer Form, emailing us at geoff@flourishsandiego.org, or calling us at 858-215-4787. Flourish San Diego’s ministry is dependent upon the gifts of individuals, churches, and foundations. Everyone serving with Flourish in staff roles raise such support and depend on the financial partnership of committed friends and churches. In addition, a variety of other partners—foundations, businesses, trusts—help fund strategic initiatives such as our Vocation Infusion Learning Community. We believe that God is the ultimate provider and that he chooses to entrust resources to his people as stewards. All these gifts are to be employed for the renewal and redemption of humanity and creation, whether they are skills, abilities, knowledge, relationships, influence or money. Our role is to provide excellent stewardship opportunities where those resources can be invested for a significant Kingdom return. We believe and have experienced that when God calls his apprentices to a place of service, he also makes provision for them. Our role is not to “convince” individuals to support Flourish San Diego, but to clearly present the opportunities available so each person can clearly discern God’s leading. Yes. 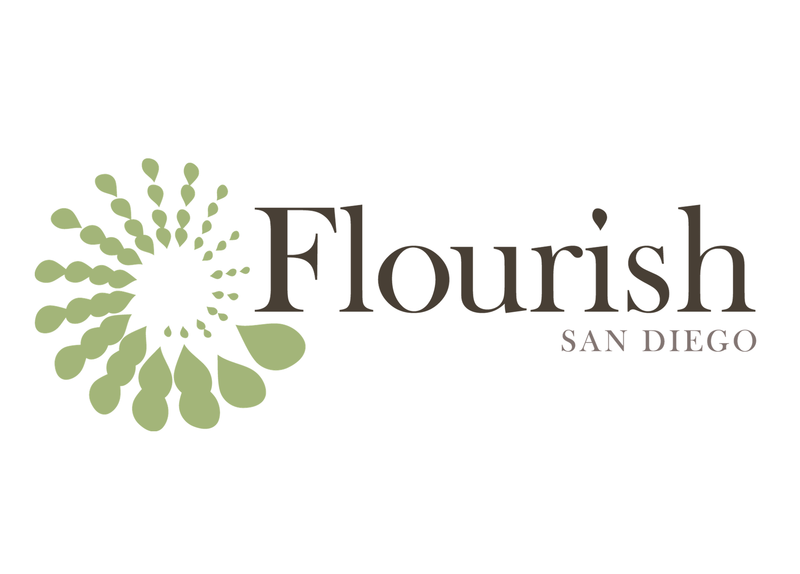 Flourish San Diego (“Flourish” for short) is recognized by the IRS as a non-profit, tax-exempt religious organization under section 501(c)(3) of the Internal Revenue Service code. Our Federal Identification Number (FIN) is 46-3138369. As with all non-profits, Flourish maintains sole discretion over any gifts made to the organization. Please email Geoff@flourishsandiego.org if you’d like a copy of our non-profit tax exempt status letter. In what ways can I make a gift to Flourish? There are a number of ways to give to Flourish: with a credit card, check, or debit card; online, in the mail, or over the phone; or by giving gifts of stock, real estate, and through Amazon Smile. Please see above to view a full list of the ways you could give. How are Flourish staff paid? Our staff rely on God’s provision for their salaries and expenses, which are provided through the gifts of ministry partners, churches, and friends. Each staff member works within an established budget system determined by the Flourish Board of Directors. If there are not enough funds given in any month, Flourish does not subsidize deficits in staff accounts. If there are surpluses in any given month, the funds roll over to meet future needs. How can I be confident my online giving is secure? Flourish uses a leader in online transactions to handle the technology and security of our online giving. Our giving page is hosted on their secure servers and we keep no record of your credit card or debit card information. Will my gifts be used toward their preferenced intent? We make every possible effort to apply donations to their intended purpose. Subject to IRS rules regarding non-profit organizations, contributions are made with the understanding that Flourish San Diego and its Board of Directors has complete control and administration over all donated funds. In the unlikely event that we cannot honor your preference, we will contact you for a new preference. If we cannot obtain a new preference from you, your gift will be used where most needed. What is Flourish’s policy regarding privacy? Flourish is committed to protecting your privacy. Any and all information submitted by you to us will not be sold or shared with any other organizations or companies. Your personal information is handled in a safe and responsible manner. Will Flourish refund a gift? As a general policy, Flourish does not refund gifts. Please email us if you have any questions. Does Flourish help with planned giving? Not yet! But we know smart people that can help us figure that out if you’d like to pursue this with us. Can I give by electronic fund transfer (EFT) from my bank account? Can I give automatically through a credit card? You may set up a one-time or recurring (monthly, quarterly, or annual) gift that is automatically charged to your credit card. The best and most secure way to give by credit card is to give online. Are there fees for contributions made through a credit card? There are no fees charged to your card, but Flourish San Diego is charged a small percentage for processing credit card transactions. We have a great discounted rate, but will still budget a couple thousand dollars for fees this year. What is the most cost effective way to support your work? Give by electronic fund transfer (EFT) from your bank account. This is also known as auto bill pay depending on what your bank calls it. Does Flourish accept stock gifts? Yes. We have the ability to receive gifts of most donated stocks and securities. Please contact us for more information. Is Flourish San Diego listed in the Amazon Smile program? Yes. You can help support Flourish even while you’re shopping on Amazon! Just select Flourish San Diego as your designated charity at smile.amazon.com. The easiest way to find us in the list of options is to search for “Flourish San Diego”. We hope this information has been helpful to you! If your question was not answered or you need further assistance, please let us know by calling Geoff at 858-449-2429 or emailing him at geoff@flourishsandiego.org.